We are glad to tell you that all QuintaDB users should be able to backup your web forms and whole projects as well as load them in case of any data loss. 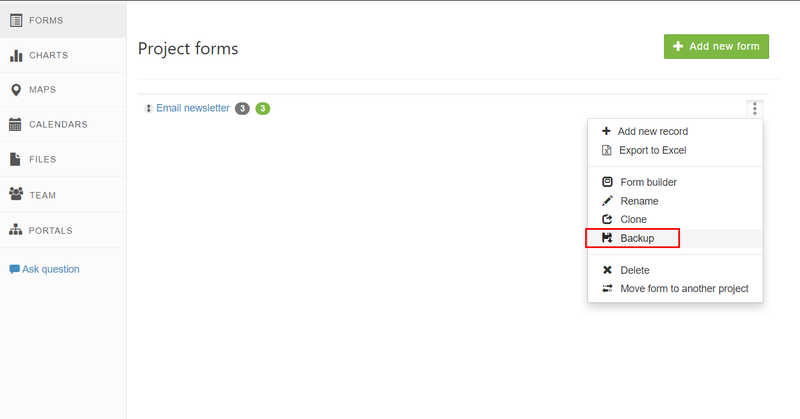 IMPORTANT: you can't load a form backup if you still have this form. You can't load a project backup if this project still exists. To restore project or form you have to click "Create new project (or form)" and you'll see Restore link. Only one difference is that when you make a backup for your web form it will save only this form structure, records, widgets, etc. And when you do your project backup it will save everything, i.e. all the forms in your projects, all data records, widgets and settings. Both form and database backups will be generated in the background and will be sent to your email. Thank you so much, this feature is of maximum importance!